Use our FREE debt snowball calculator to find out the quickest path for paying off your debt. This calculator utilizes the “rollover” method for ditching your debt as quickly as possible. It’s simple. As each debt is paid off, the freed-up amount for that creditor is applied to the next debt, keeping you on track to be totally debt free! You are about to see that this method can save you a ton of money in interest charges -- and will help you on your journey to become debt free in a shorter time! Note: If you include your mortgage in your Accelerated Debt Payoff Plan, be sure to enter only the principal and interest portion of your monthly mortgage payment. Do not include the monthly amount for taxes and insurance. If you would like your results emailed to you, fill in and submit the form and we will get them right to you! 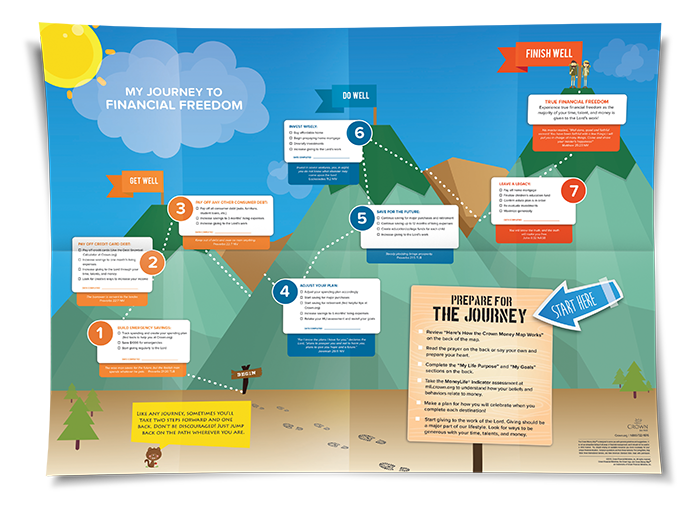 The road to financial freedom is a journey — but how do you get from A to B? Start with the Money Map, a FREE, practical and user-friendly resource that will help walk you through a step-by-step process.